Playtech has combined a variety of different themes to create Lucky U. The highlight of this straightforward 5 reel, 5 payline video slot is the bonus round that awards 5 free spins. Each star that lands here awards the repeating win which comes on top of standard payline payouts. Play on your PC, tablet or mobile device from between 5p and £500 per spin. There’s a somewhat unusual look to Lucky U. The reels are made up of lower value A to 9 symbols as well as more rewarding pyramids (with an all-seeing eye), burial masks, lions and bulls. The most lucrative symbol is the purple gemstone which pays 10, 20 or 100 times your bet if you land 3, 4 or 5 on a payline. The silver star is the wild. That can land on reels 2, 3 and 4 only. When it does, it substitutes for all symbols bar the horse shoe scatter. 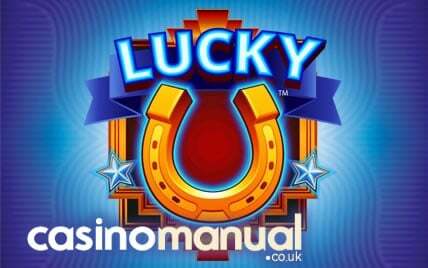 That horseshoe is the key to unlocking Lucky U’s Free Games feature – land 6 of them and you’ll receive 5 free spins. Those horseshoes also come with a cash value attached. This amount from the triggering spin is carried through to the feature as the repeating win. Every time a star lands during the feature, it triggers a payout of the repeating win as well as adding 1 additional free spin to your total. That’s your lot as far as gameplay goes. If you’re after plenty of backstory and a range of extras, then you won’t find them here. This is a very simple game. The design is solid enough but it’s nothing particularly special and the theme seems rather confused. The Free Games feature can be decent enough if you manage to land a high value horseshoe repeating win amount. The overall variance is in the medium range. The gameplay was a little to vanilla for us. If you fancy simple, basic action then that’s precisely what you’ll find in Lucky U. Playtech plenty of other better video slots with Age of the Gods Medusa & Monsters and Eliminators my picks.